Still Time to book the last places on the Cas Holmes two day wokshop on the 5th and 6th of February. “Madder” by Cas Holmes – Last week to see this stunning Piece in Eau Brink Studio. For more information call Anita on 01553 762115. Cas Holmes is coming up to Norfolk!! 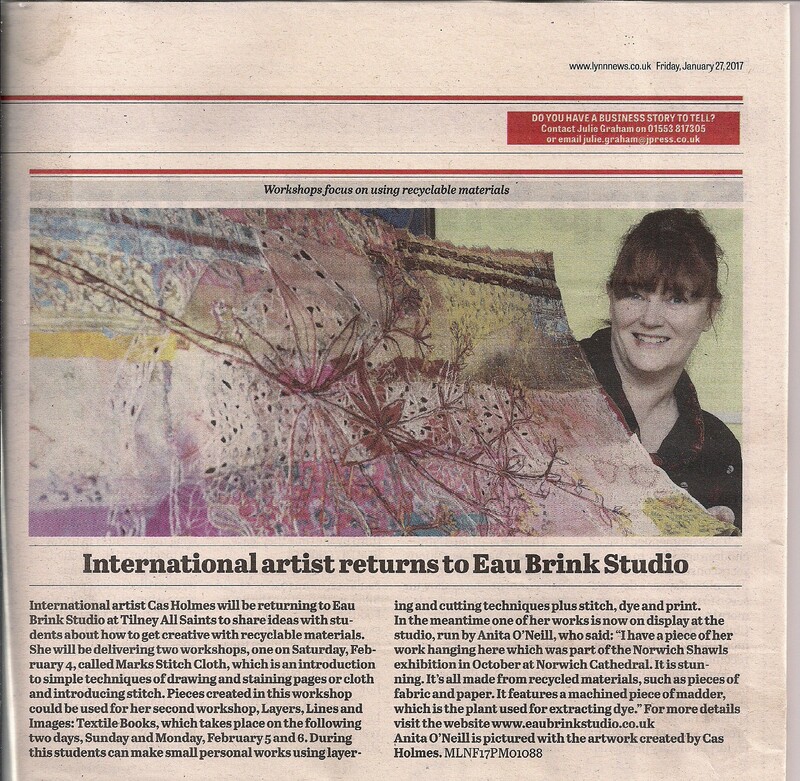 This internationally renowned artist, who you can usually only get up close and personal with much further afield, will be joining us at Eau Brink Studio, in King’s Lynn, for a wonderful textile workshop next week. 5th and 6th February from 10 am till 4 pm each day. 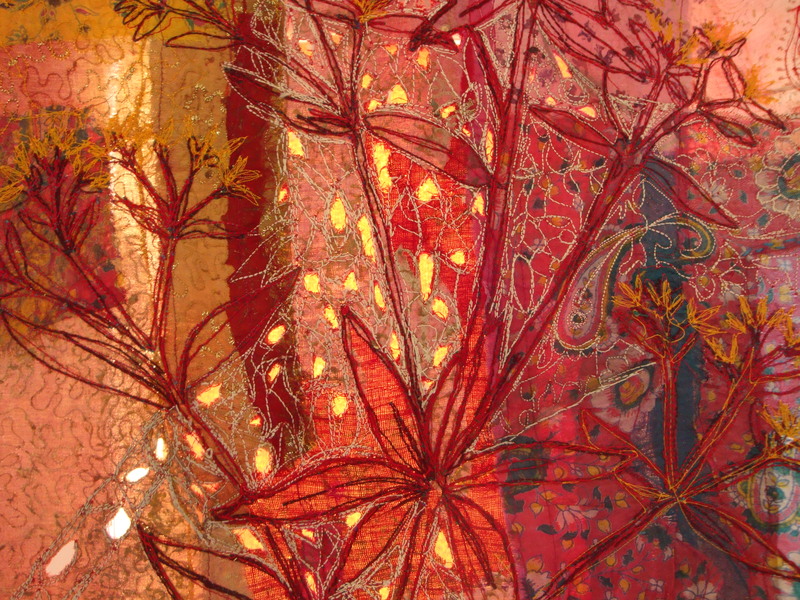 During two days of bliss, we will be exploring rubbing, staining and mark making, on paper using drawing/painting media and stitch. Reference will be made to paper lamination layering of paper with found materials and fabric using techniques adapted from Japanese screen making and paper crafts. As you work you will look at the references to text and other images you have collected. and consider how you may want to place them together. You will leave with a beautiful and useful textile book; a record of your progress with the techniques used over the two days and, like a sketchbook, the perfect reminder for when you want to recreate other textiles using the same techniques or develop it further. 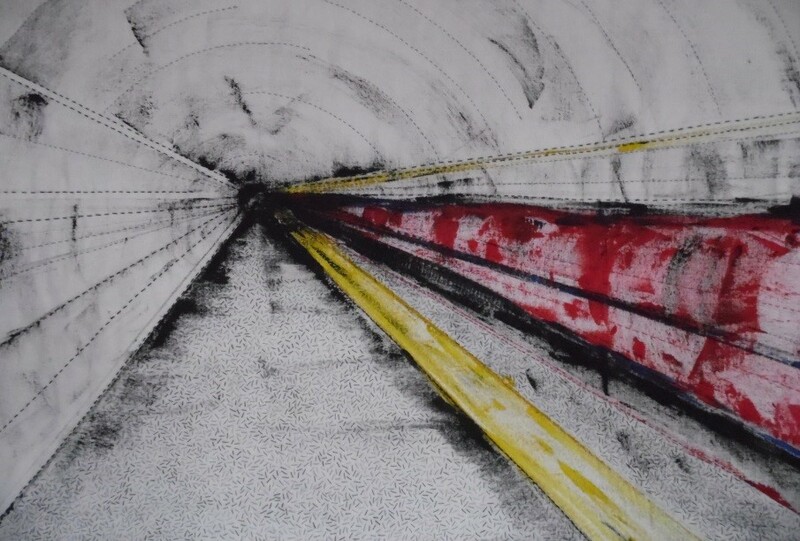 This workshop is perfect for you if: You’re wanting to feel more confident with using found materials and your drawing techniques. You want to learn new textile techniques. You want to learn how to interpret your subjects using fabric and paper. Places are just £120 for the two days and include all refreshments (not lunch) additional materials you may need such as papers, and media including inks, paints, fabrics. For the past 7 days I have been working on small pieces to complete a challenge set by Marion Barnett. It made me think each day on what I was going to do and how I was going to achieve it. Most of the pieces will be used as samples for my degree work. It was not until I have put them all together that I realised that two of them are the same colours but were very different techniques. Today we all enjoyed a day screen printing including Thermafax screens. The day started with a brief description of the materials we were using and the equipment and then a quick demonstration on technique. Everybody then enjoyed the morning getting to grips with using inks and acrylics before the afternoon using it on fabric. The results are lovely with many showing texture and depth. Making stencils out of paper to use with the screens was a little challenging but the end results were satisfying and some even added a little foil for that added bling. I have shared an artist on my facebook page who uses bubbles to decorate her pots making them look like marble. This technique can be used for most things you wish to decorate. This hat is based on an Elizabethan night cap. It is a piece I made for City and Guilds many years ago. I also used the same technique for my degree in the first part. I will be organising a new workshop for this technique very soon. A couple of months ago I was asked if I could help with a button and brooch bouquet for a lady who is getting married and loves vintage items. and here is the finished item. I am going to be making two more. One will be using red roses and the other I am waiting for the lady to decide on her colours. I will post them as I finish them for you to see. Just a few of the lovely results from the workshop on Saturday. We had a great day using Scolabrush on its own and mixing it with other medium. Lots to think about for future projects.